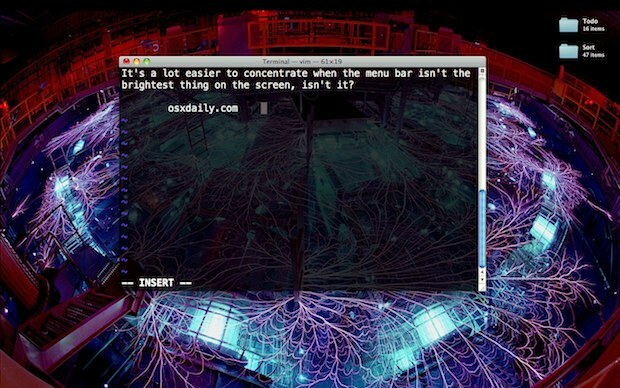 Want to hide the Mac menu bar? You can do that and set a few more options to automatically hide and show the menu bar with a free utility called MenuEclipse, the end result is pretty similar to the way you can automatically hide and show the Dock. In the screenshot above, I have the menubar completely hidden, but it will activate if I move the cursor over the menu bar. You can completely hide the menubar like the topmost screenshot, but it’s not too useful because you can’t reclaim that lost screen space, instead it’s best to just dim the menu bar when not in use. 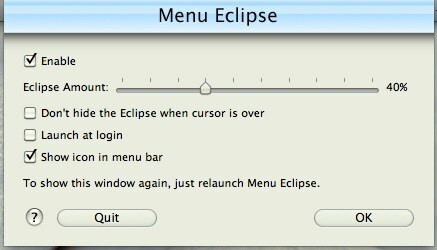 MenuEclipse is a free download available from Xybernic.com, version 1.3 is technically outdated (works fine in Mac OS X 10.6.6+) and there’s a new version available, but the features of the new version didn’t seem that useful to me. Check out some other ways to customize your Mac. Looks nice I like this, and what is your wallpaper? Will you share? Google: The Z machine Los Alamos the picture was the first one. The menu bar isn’t hidden, technically, just saying. But a very good solution none the less, thanks for the share. Stinks that it won’t go for total transparency. Where can I find a download for 1.3? Every link I try sends me to a xybernic page saying that it isn’t available. this never answered the question of HOW TO MAKE IT GO AWAY! even in full screen games it’s still there so i can’t see the score or anything else important! Put the game into Full Screen Mode if you want the menu bar to hide, that is an option that game developers have to include, but some don’t. It’s not the Mac operating system making that decision, it’s the game developer. « Happy Birthday Steve Jobs!